TURF FARM SELLS GRASS LIKE NEVER BEFORE! 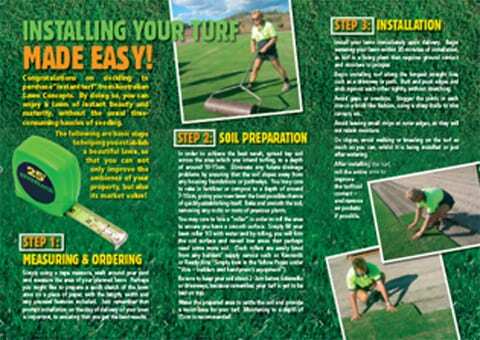 One of the more unusual industries John has been involved with is the “turf” business – in other words, the “lawn” industry. 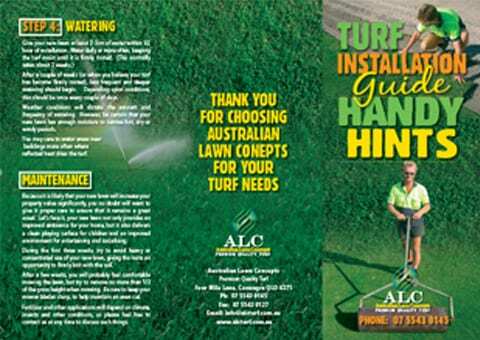 John was requested by Australian Lawn Concepts, one of Australia’s larger turf farms, to put together a strategic marketing plan. ALC is located at the base of Mt. Tamborine on the Gold Coast in Queensland. b)	Homeowners, particularly in new areas. He therefore proposed both short & long-term marketing strategies for each of these markets. 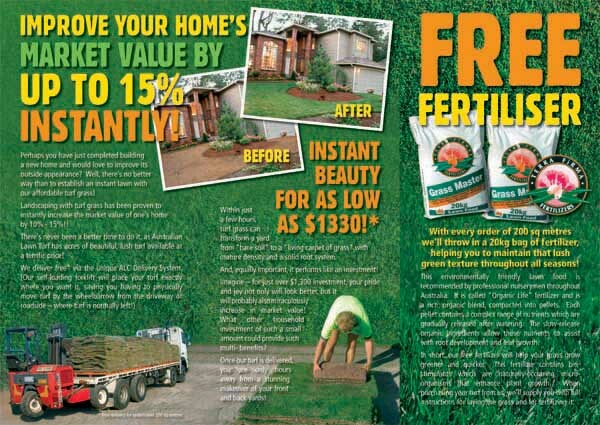 In the case of Landscapers, John produced an innovative Direct Mail Campaign which featured an offer “too good to refuse” for most thirsty male landscapers! 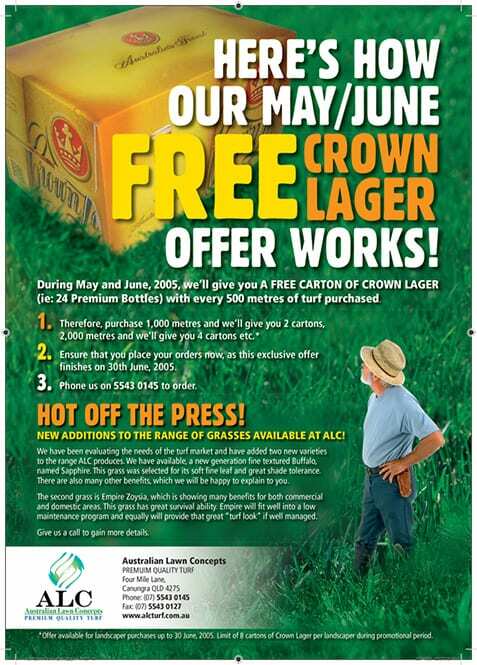 ie: For every purchase of 500 sq mtrs of turf (about 1 regular home’s worth), the landscaper would receive a FREE CARTON OF CROWN LAGER PREMIUM BEER! After gaining a database of over 500 landscapers in the Gold Coast/Brisbane area, the plan was to mail a brochure and personal letter to each. As you can see from the A4 size brochure featured on this page, the FREE BEER OFFER was certainly “highlighted” as a unique offer – immediately creating a “unique selling point” for ALC. The interesting thing about John’s “wow factor” for this industry was that the value-add incentive was in no way related to the actual “turf product”. “What’s beer got to do with grass” you might ask? Generally speaking, landscapers didn’t really care where they purchased turf from – price was normally the deciding factor. John’s intention was to take the emphasis away from price, so that ALC retained its proper margins. And what better way to distract a landscaper! FREE BEER!! In the case of new homeowners, a Direct Mail brochure was designed for ongoing distribution to “new areas”, where houses had just recently been built. DL size 6 panel brochure which was letterbox delivered to areas with new homes. John’s research was able to uncover a very powerful statistic, where analysis from the U.S.A. had indicated that by laying new turf, homeowners immediately increased the market value of their home by 10 to 15%! “This statistic alone is a mighty persuasive marketing tool” says John. A value-added giveaway of free fertilizer was also offered, for every 200 sq. mtrs of turf ordered. 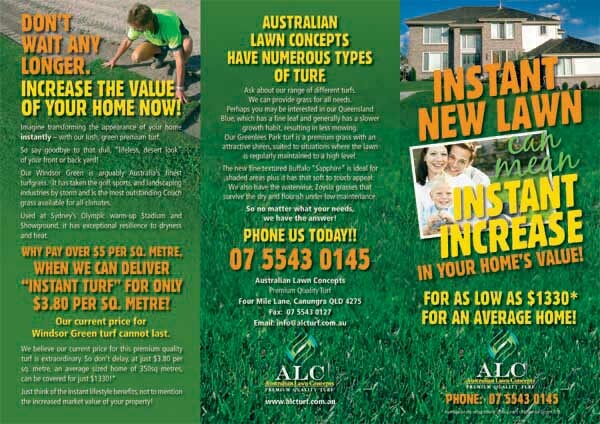 So, once someone was convinced that they could instantly increase their home’s value by laying new lawn, John ensured that they chose ALC because of numerous features, one being free fertilizer. John also produced a Handy Hints brochure for Homeowners who chose to lay their turf themselves. The results of these campaigns were staggering. 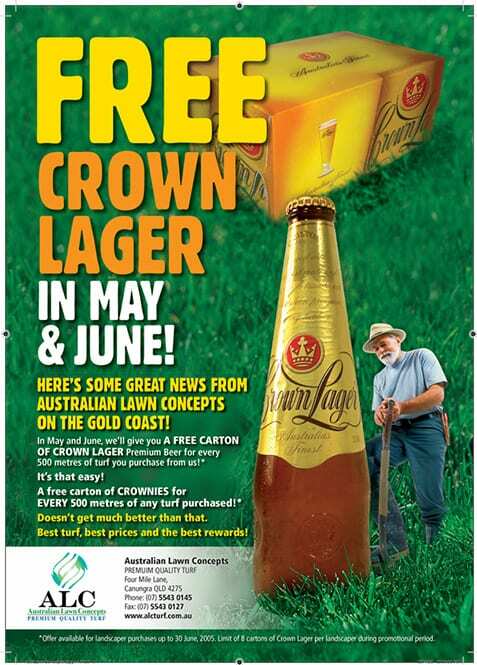 After mailing less than 50% of the 500+ Landscapers Direct Mail Offer of Free Beer, Australian Lawn Concepts had to delay further mailings due to delivery congestion! The company couldn’t keep up with landscaper demand! Landscaper response to the “Beer Offer” was astounding, with sales going through the roof, not only due to original orders, but also due to repeat orders! It seems Free Prestige Beer can create “loyalty” overnight! The Homeowners Direct Mail Campaign also met with instant response and its success has now provided ALC with a marketing template for consumers all year round. Once again, a bit of creative flair and some “wow factors” combine to create instant and constant sales.